Wow, that would indeed be impressive. Is perhaps Camden Yards one of those rare examples like the Minneapolis Metrodome, of a stadium where the public put up a bunch of money up front but then was repaid in full and more by lease payments over time? Spoiler: no. Documents show the authority has received an average of $6.4 million in annual rent from the team, plus $4.1 million a year as its share of state admissions taxes. The total, through the fiscal year ending June 30, 2016, is $255 million. That compares favorably with the stadium’s original $225 million price tag, including $100 million for land acquisition and $125 million for the stadium. The stadium authority said it pays about $15 million a year in debt service — principal plus interest — on the 30-year bonds issued to pay for Camden Yards. So by the Sun’s own calculations, Maryland is actually losing money on Camden Yards. Anything else? The debt service, however, is paid with Maryland Lottery proceeds appropriated each year by the General Assembly. The authority uses the team’s rent money for ballpark operations. Oh, right, ballpark operations costs. So really the Orioles’ rent payments pay nothing towards the public’s debt on Camden Yards. Lovely headline, though — beautiful plumage. If current trends are going to continue, circa-1990 stadiums like SkyDome/Rogers Centre, New Comiskey Park/U.S. Cellular Field, and even Camden Yards would have to be replaced by the end of this decade. Okay, probably not Camden Yards — though I wouldn’t be shocked to see the Baltimore Orioles ask for “improvements.” But it’s going to be very interesting to see whether teams start demanding new stadiums, and if so how they justify them, as the first wave of “retro” parks start going out of warranty. As it turns out, whoever had 2015 in the “When will the Orioles owners ask for upgrades to Camden Yards?” pool, you’re a winner! The latest stadiums incorporate design elements — such as open concourses commanding views of the game — that Camden Yards lacks. Many also include stadium clubs for VIPs that offer prime, low-level field views. The state holds a capital expenditure account that might be used. And since there is some retired debt on Camden Yards, new bonds could be issued to finance improvements. Guh? I’d ask on what planet it would make sense for the state to finance upgrades that will benefit solely the Orioles, but the Baltimore Sun website never answers when I shout at my computer screen. The one possible silver lining is that the state might ask the Orioles owners to extend their lease beyond 2021 in exchange — “Typically, when you see a very large amount of capital expenditure, it comes with a new lease negotiation,” Maryland Stadium Authority Michael Frenz told the Sun — though given that they have a decent sized market and a popular stadium and are making money hand over fist, it’s not like they could reasonably threaten to leave with or without a lease. Maybe the MSA will offer to float some bonds for stadium construction in exchange for the Orioles offsetting the bond costs by paying more in rent — ha ha, we all know that’s not likely to happen. But we can dream, can’t we? Bloomberg has a long article today counting the ways in which the Baltimore Orioles‘ Camden Yards has been a lousy investment for the city, costing taxpayers $282 million and bringing little tangible return. (Disclosure: I was interviewed by one of the reporters, but I’m not quoted.) Much of it ends up being he-said-she-said, but the hes (or the shes?) 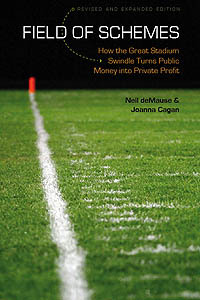 include a nice list of stadium experts, from economists Arthur Rolnick and Victor Matheson to Baltimore community activists William Marker and Julian Lapides, who were two of the first people I interviewed when I started research for the bookField of Schemes a billion years ago. “While it expanded the tourist bubble to the west, it didn’t wholesale save the downtown economy or prop up very poor neighborhoods not too far from downtown,” Chapin said. The Baltimore Business Journal’s James Briggs complains that Camden Yards is unfairly being made the “poster child” for bad stadium deals when there are so many worse ones, but that really misses the point here, which is: The Orioles’ stadium has been widely portrayed as the poster child for successful stadium deals, but in fact its return for Baltimore has been somewhere between meh and craptastic. At best, you can say that the Camden Yards stadiums haven’t done much of anything for the surrounding neighborhoods, except bring a bunch of people to drive past them 81 times a year en route to the Orioles-controlled shops along Eutaw Street inside the stadium gates. The Waverly neighborhood around the Orioles’ old home of Memorial Stadium, meanwhile, appears none the worse for wear since the team’s departure. On second thought, maybe this should go on some kind of poster, because the occasional Bloomberg article sure doesn’t seem to be getting the message across. The club levels at Camden Yards will get a second look because the corporate appetite for expensive suites has diminished. It hasn’t helped that the Orioles last had a winning record in 1997 and drew their smallest crowd ever at Camden Yards earlier this season. The Orioles are not the only team thinking about makeovers. 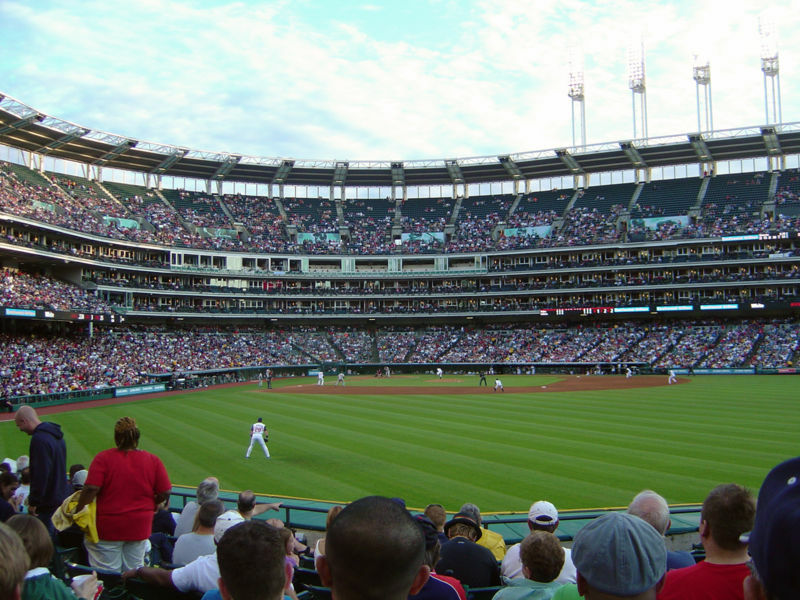 The Cleveland Indians, who opened Progressive Field in 1994 (it was Jacobs Field then), are among the 10 teams looking at ways to revive their parks, said Earl Santee, a senior principal at Populous, the architectural firm that designed Camden Yards, PNC Park in Pittsburgh, Coors Field and other retro stadiums. This has been an issue I’ve been wondering about for a long time: What do modern stadiums that are designed for the luxury market do when that market evaporates? In olden times, it was easy enough to just rejigger ticket prices, but today’s class distinctions are cemented in concrete and steel — you can’t easily take just one chunk of glassed-in seats with their own restaurant and private entrance and turn them back over to the great unwashed. Cleveland is going to be an interesting test case for this, as it has that vertical wall of club seats separating its lower deck from its upper. I’d love to see the recent generation of class-segregated stadiums retrofitted for more egalitarian uses, but it’s going to be a challenge. Mets Wine Pairing * Wine Tasting Event in the Empire Party Suites * The ticket price includes the cost of food! * Tickets only $75!